In September and October 2015, tens of thousands of fires sent clouds of toxic gas and particulate matter into the air over Indonesia. Despite the moist climate of tropical Asia, fire is not unusual during those months. For the past few decades, people have used fire to clear land for farming and to burn away leftover crop debris. What was unusual in 2015 was how many fires burned and how many escaped their handlers and went uncontrolled for weeks and even months. 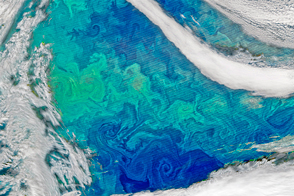 While some NASA satellite instruments captured natural-color images of the smoky pall, others focused on gases that are invisible to human eyes. For instance, the Measurement of Pollution in the Troposphere (MOPITT) sensor on Terra can detect carbon monoxide, an odorless, colorless, and poisonous gas. 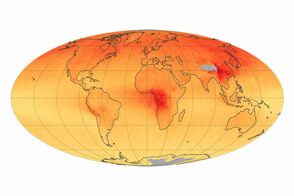 As shown by the map above, the concentration of carbon monoxide near the surface was remarkably high in September 2015 over Sumatra and Kalimantan. While all types of wildfires emit carbon monoxide as part of he combustion process, the fires in Indonesia released large amounts of the gas because in many cases the fuel burning was peat, a soil-like mixture of partly decayed plant material that builds up in wetlands, swamps, and partly submerged landscapes. Read more about studies of Indonesia’s fire season in our new feature: Seeing Through the Smoky Pall. 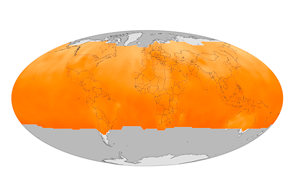 NASA Earth Observatory map by Joshua Stevens and Jesse Allen, using data from the MOPITT Teams at the National Center for Atmospheric Research and the University of Toronto. Caption by Adam Voiland. 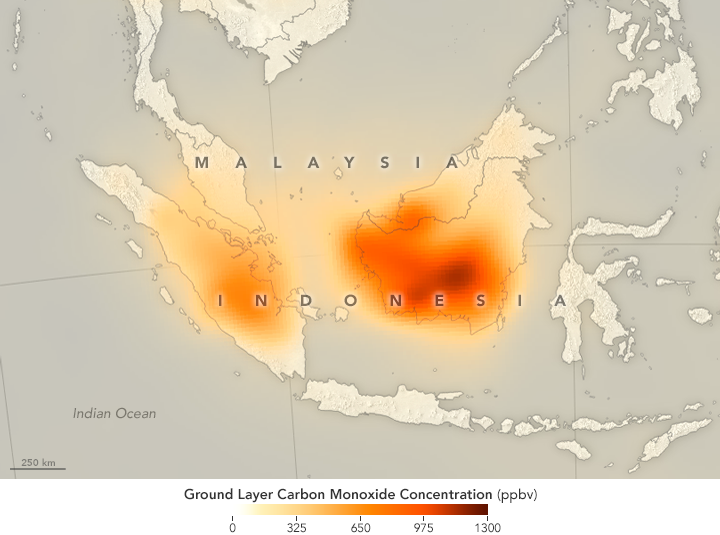 In September 2015, fires in Indonesia produced prodigious amounts of carbon monoxide.